Davida Casey is manager of coaching and programs at StriveTogether, supporting the development and implementation of cohort- and community-based programming. As an industrial designer turned social innovator, she finds passion in working across disciplines toward solving institutional and social issues by employing design thinking methodologies. She has worked for both corporate and private design companies to develop products that not only connect with consumer needs but also fit seamlessly into their lifestyles. In bringing these skills into the social sector, Davida has helped plan and facilitate empathy building and design thinking workshop experiences for Cincinnati Children’s Hospital, United Healthcare, P&G, GE Aviation, Tri-Health Bethesda and 84.51. 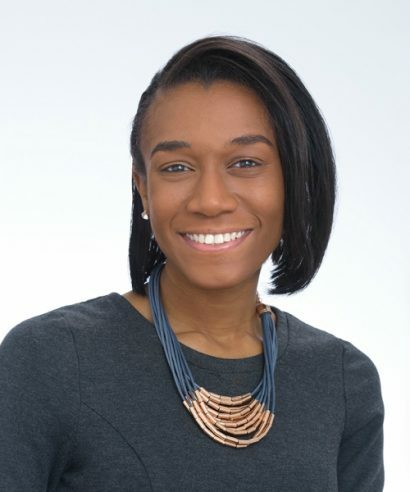 Recently, she worked to develop products to increase adherence among in-patients at Cincinnati Children’s Hospital and helped code, implement and test apps for teens with Sickle Cell Anemia to manage their illness. Independently, she also has partnered with local entities to construct communication tools that dismantle the trust barrier between social workers and low-income, minority, single mothers. While she has gained acclaim for her work in innovating for the underserved, she considers the relationships she builds along the way as her chief accomplishment. Davida received her bachelor of of science degree in industrial design and master’s of science in design from the University of Cincinnati. She currently lives in Cincinnati with her husband, 7-year-old son and beloved box turtle, Gary. Mrs. Riley — she was gentle, yet authentic and challenged me to be the same. My 2nd grade teacher laughing at a funny story I wrote. Seeing an adult draw pleasure from something I created meant so much. What’s something you’ve learned to do as an adult? Anywhere new with a close friend.